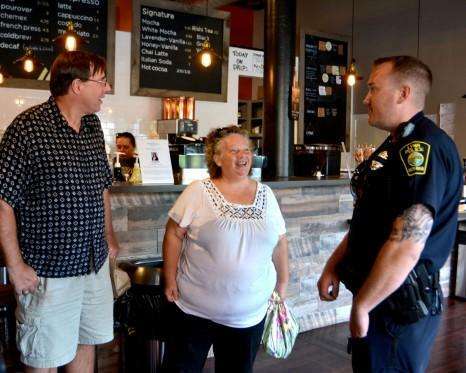 Jay and Bethany Pike talk with Patrolman Ryan Dulong, of the Lynn Police Department, meets with people at the Land of a Thousand Hills cafe on Munroe Street in on Saturday. LYNN — Eva Yeno, a West African native and Lynn resident, was curious about the “Coffee With A Cop” event and stopped by the Land of A Thousand Hills cafe to check it out. Five years ago, police officers in Hawthorne, Calif., hosted the first “Coffee With A Cop” gathering to improve relations between law enforcement and the community.